December 17, 2003 marked the 100-year anniversary of the first powered, controlled, sustained flight by Orville and Wilbur Wright from the sands of what is now the town of Kill Devil Hills on North Carolinas Outer Banks. Flight enthusiasts around the world joined in as the centennial was celebrated in Kill Devil Hills at the National Park Service Wright Brothers National Memorial; in Dayton, Ohio at the birthplace of Orville and Wilbur Wright; and in Kitty Hawk, North Carolina, at a Monument commemorating aviation's first century. Offered by Icarus International, Inc. as an enduring legacy to the history and the beauty and mystery of flight, this public Monument recognizes significant accomplishments and milestones in aviation history and honors the soaring spirit of the men and women whose aspirations spoke, and continue to speak, so clearly of human potential. 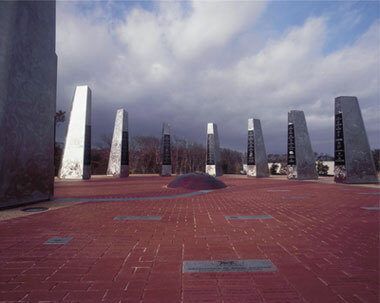 The Monument to a Century of Flight is endorsed by the U. S. Centennial of Flight Commission, the NC First Flight Centennial Commission, the First Flight Society, the Dare County Board of Commissioners, the Town of Kitty Hawk, the Outer Banks Visitors Bureau, and countless aviation enthusiasts. © Copyright 2007 The Town of Kitty Hawk. Site design by 8 Dot Graphics.